Main programs are drawn with square corners whereas subroutines are drawn with rounded corners. Includable diagrams are drawn with bevelled upper left and lower right corner. Depending on the chosen type of diagram and whether your diagram is boxed or not, the diagram is drawn differently. The type of the diagram (main or sub) usually influences the source code generator and may thus result in different code. Only diagrams of type sub are callable, i.e. may be employed by the executor if referenced in a Call element (also see Program/Sub). 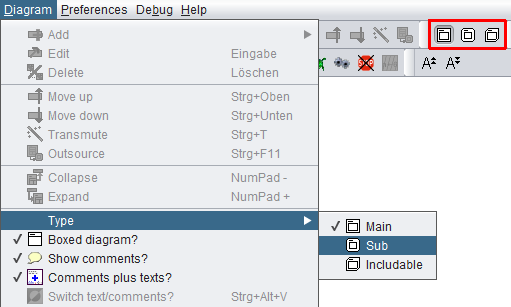 Diagrams of type includable are meant to be referenced by a main, sub, or other includable diagram via the include list (see Program/Sub). As to be seen in the images above, the heading (and the possible bottom margin) of an un-framed diagram will appear in gray whereas the box of a boxed diagram is white (unless being selected or marked as test-covered, of course).